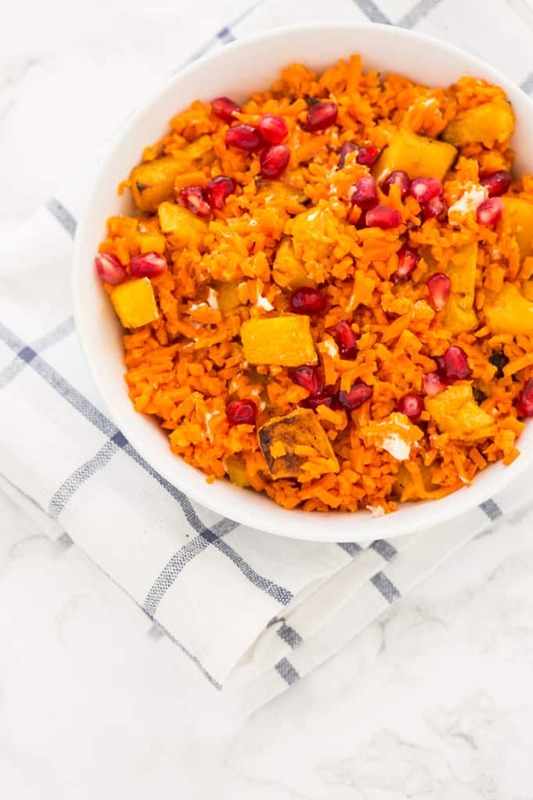 I really wanted to name this recipe the “‘Tis the Season Sweet Potato Rice Bowl,” but for SEO purposes, that wasn’t the best idea. As a blogger (and I’m JUST now realizing this), the title of your post is crucial. You can’t just slap up any ‘ole name up there – it has to be very calculated. 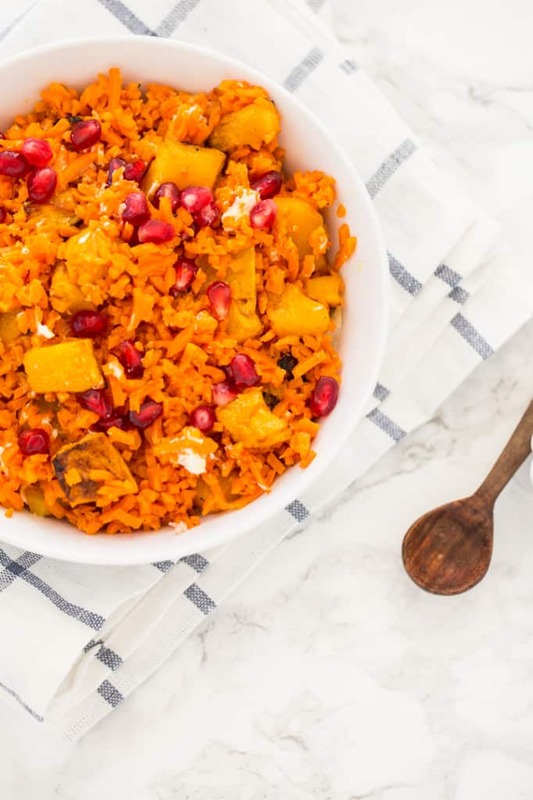 With ingredients like pomegranates, butternut squash, sweet potatoes and maple syrup, this dish screams ’tis the season, doesn’t it?! Speaking of, if you’re not already signed up for our newsletter, NOW’S THE TIME, because all newsletter subscribers will receive early-access to our 20% off Cyber Monday deal (on the Inspiralizer®!) Sign up and you’ll receive the exclusive coupon code emailed to you within the hour. And of course, I want people to discover Inspiralized, I want everyone to become Inspiralized, so I need to play by Mr. Google’s rules. Anyway, I don’t know about you, but I can barely sit still in my desk chair, I’m so excited about Thanksgiving. I think maybe because I’ve been working around the clock lately and am juggling so many things, I’m just excited to chillax with my family. Maybe it’s just because this is my first Thanksgiving as a married woman? Who knows, but I’m ready to devour some stuffing and sip champagne. Speaking of being married and devouring stuffing, I’m launching another “phase” of my fit journey. Ever since Lu and I got married, I haven’t been as diligent with my workouts and healthy eating. I’ve noticed myself falling back into my “old habits.” What are old habits? Mainly overeating and a sporadic exercise schedule. I’m not embarrassed to admit that I’ve gained about 10-15 pounds since the wedding. At the wedding, I weighed about 140 pounds and a lot of that was toned muscle, because I was lifting almost every workout. I felt very lean – I felt my best! Now, I waver between 150-155, depending on the week. Now, I’m 5’8″, so that extra five pounds isn’t life altering, but I really enjoyed that healthy weight – my energy levels were high and I just felt like a better version of myself. Since then, I’ve had a tough time finding the motivation. The summer was a blast and busy, and now as we enter into the winter, my selection of jeans that I can wear are dwindling slightly, thanks to the extra poundage. So what can I do? Go back to basics and do exactly what I did in the first place: eat clean and exercise consistently. No more running down to the corner store and grabbing a bag of Pepperidge Farms cookies at 9:55pm (5 minutes before they close!) and scarfing them down, only to go to bed an hour later. That’s not healthy and it doesn’t make me feel good, inside or out. I’ve always struggled with overeating (I’d call it binge eating, but I’ve never been diagnosed, let alone seen a doctor about it.) I think the chaos of getting married and the pressure to fit into my tiny (but beautiful!) dress resulted in a little burnout. And that’s okay. It’s okay to regress. It’s okay to fall into our old habits. What’s more important is knowing when it’s gone on for too long and it’s time to make a change again. I wanted to address this in today’s post, because one month from today, I’ll be in Florida, spending the holidays on the beach. I want to focus on this month and more importantly, focus on my health and my body before I have to be back in a bathing suit. And if there’s one time of year that I don’t want to think about anything but my family, it’s Christmastime. It’s just great timing and I work well with time-oriented goals. You may be thinking, “Ali, it’s the holidays – it’s the toughest time to do this!” I acutally don’t feel that way – the busier I am socially, the more I tend to be focused on my diet and exercise. I think it’s the fact that I have to squeeze it into my days that makes me prioritize it. However, I haven’t said that yet. There’s a difference between going to bed on a Sunday night and saying, “Tomorrow’s the day!” It’s definitely about a complete mental shift, but it’s also about planning. You can’t go to bed and expect to wake up and turn over a new leaf – you need to prepare for that. Make a workout schedule, not only picking days to workout but also set which workouts I’ll do on which days. Tell everyone about it, including all of YOU. I think this is almost most important, because when you’re out with your friends and you don’t want to order dessert, they’ll understand and you won’t have to repeat yourself or have that momentary awkwardness. Also, if you live with something (whether it be a roommate or a husband/wife/boyfriend/girlfriend/parent), they can help keep you accountable. Drink a LOT of water. Just start drinking water the second you decide to make a healthy shift – it will clear your mind, give you more energy and put you in a better place to make the right decisions. It seems really simple, but it’s one of my go-tos. Prepare – meal plan, set your menus for the weeks, grocery shop, and then meal prep. Get all the tools you need together to set yourself up for success. If you want to follow me in this journey (I’ll be posting weekly weigh-ins), follow my fitness account, @GetInspiralized. And please no negative comments about “scale obsession.” I don’t live or die by the scale, it simply helps me get back on track in the beginning. After this initial month, I’ll post a “recap” and show my progress! Thank you in advance, I know all of your comments are going to keep me going and get me back into the shape I want to be in not just for the beach, but for my everyday happiness. If there’s anything you’d like to me share in the next month that may help you in your own fit journey, please don’t hesitate to leave a question in the comments or e-mail me. Oh and completely unrelated, don’t forget to mark your calendars – we’re having a Cyber Monday WEEK and the Inspiralizer will be 20% off starting on Monday, November 30 and ending on Friday, December 4th. BUT if you’d like EARLY ACCESS to this promotion, just subscribe to our newsletter and receive your exclusive early access 20% off code! Place the maple syrup and half of the olive oil in the bottom of a medium mixing bowl and whisk together. Place the butternut squash cubes in the bowl, season with salt and pepper and toss together to coat. Lay the butternut squash out on the prepared baking sheet and bake for 35 minutes or until baked through and soft, and slightly browned. Meanwhile, remove the seeds from the pomegranate. Rinse the mixing bowl used to season the butternut squash and fill with water. Slice the pomegranate into quarters and submerge it under the water and carefully remove the seeds. The seeds will sink to the bottom and the white flesh will rise to the top. Scoop out the flesh with a slotted spoon and then drain the pomegranates into a colander and set aside. Save 1/4 heaping cup of pomegranates and reserve the rest for future use. Next, peel and spiralize the sweet potato, using Blade D. Place the noodles into a food processor and pulse until rice-like. Place a large skillet over medium heat and add in the rest of the olive oil. 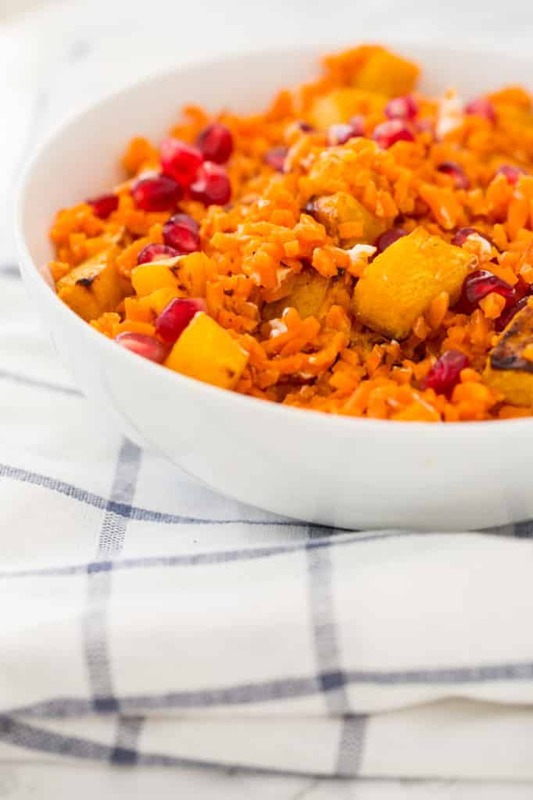 Once oil heats, add in the sweet potato rice and season with salt and pepper. Stir and cook for 1 minute. 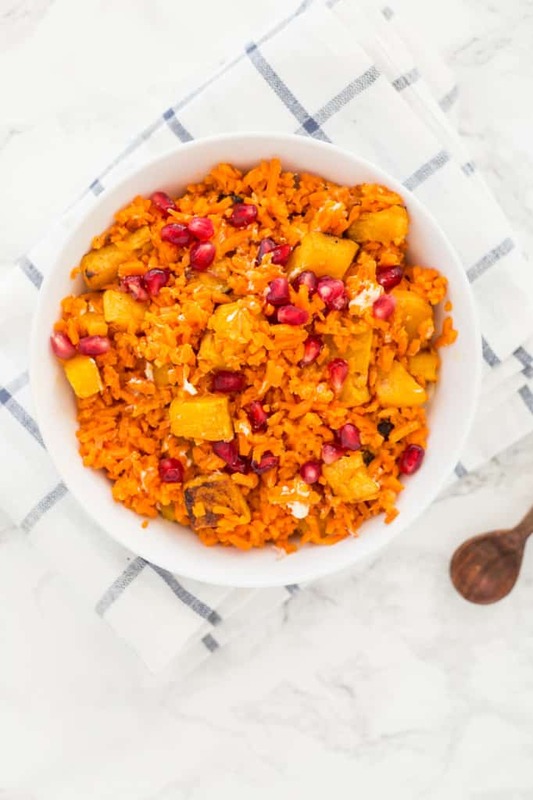 Cover the sweet potato rice and cook for 5 minutes, uncovering to stir occasionally and then let cook for 3 more minutes, uncovered, or until sweet potato rice reaches your preferred rice-like consistency. Stir in the goat cheese, remove from heat and add in the butternut squash. 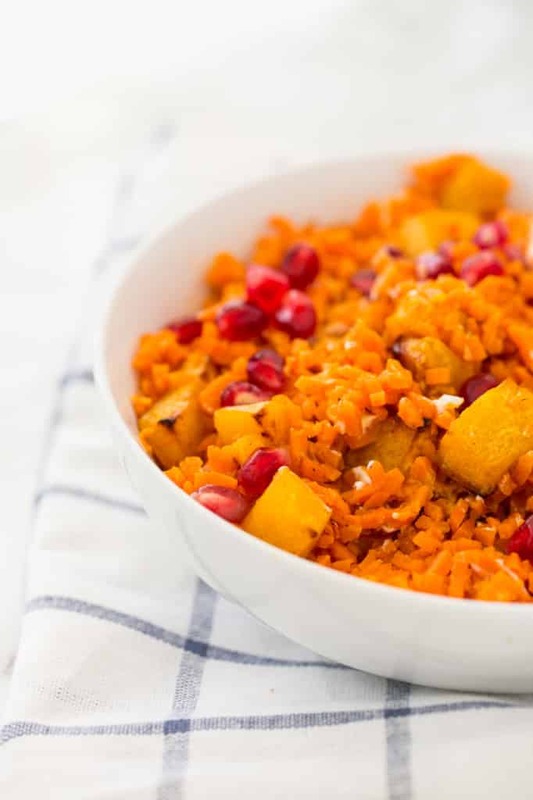 Divide the sweet potato into bowls and top pomegranates. You frequently ask your readers about which content they like the best in your posts, and your completely honest posts like this are the reason I follow this blog so diligently. As a dietitian counseling people on what to do for the weight/health I can get pretty down on myself when I fall back into old habits and don't follow the advice I give my patients. I got into the nutrition field because I suffered from a mild eating disorder in college and becoming educated in nutrition made me feel in control, but also came with a new set of pressures to set the example. I recently lost a decent amount of weight/gained muscle training for fall marathons, and I also got engaged. Trying on dresses at my lowest weight in years has already put me into a panic, worrying that I'll gain weight before the wedding (which is awhile away). Last night I was stressed and polished off a bag of popcorn (old habits!) Reading your post has reminded me that we all face struggles with our health, and part of helping others on their health journeys is being honest about the one we're on. You do that 100% and it's a real service to your followers. Have a very happy Thanksgiving and thank you for your honesty! Thank you so much Shelbi and I couldn't agree more that we all face struggles with our health, even if we're in the health industry! We're humans at the end of the day, and we all should give ourselves a bit more lenience. Congrats on your engagement! 10 pounds in 1 month is feasible? Seems a little much considering I've always heard a max 2lbs/ week is healthy. Well, good luck either way! Also, I'm vegan and I know I could simply remove the feta from this recipe. But wondering if you have any ideas on what I could substitute to add more flavor? Whenever you've been overeating, you always shed water weight in the beginning, so 10 is feasible, yes! That's 2 pounds/week for four weeks = 8 pounds. 2 extra pounds is the water weight! And yes, you can remove the goat cheese if you're vegan - I'd recommend adding in some coconut cream to make it creamy! Mika, congratulations on the weight loss and feeling so amazing! Your comment's inspiring, I appreciate it! My husband and I are finally committing to getting back on the healthy bandwagon. We've been using every excuse in the book between "we're so busy this summer", "we're moving", "we just moved"...that even though the holidays are crazy there's no better time to start than today. There's always an excuse if you're looking for one. Looking forward to seeing your progress! So nice to realize you are as human as the rest of us! I follow WW and have kept off the weight due to the lifestyle promoted by WW. It's very doable for a long time. Not like fad diets or diets that restrict anyrhing. I think your goal is reasonable. I think that because these "extra" pounds are fairly new, they haven't been around as long and are easier to lose. It's the "squatters" that have been around a long time that are hard to get rid of. JMHO. You caught my attention with that delicious-looking recipe and kept my attention with your honesty. I too confess that I overeat too often-- I'm not sure why, but I've never been good at being intentional with my eating. Your point about doing this during the holidays is a good one. Thanks for this post! Thank you so much for always being so open and sharing. I also put on some weight after my wedding, whether that had to do with moving cross-country, living with amazing food in California, or just being less strict post-wedding, I'm not sure.. though, probably a combo! It's so great to have a set goal/event in mind when you're losing weight, rather than just losing x amount whenever. I think you'll do great because you've already started to set yourself up for success. Yahoo-I'm excited for you! I am very thankful for your honesty and how you show that you're 'real' in your posts-like previous commenters said, these are some of my favorite posts of yours because they are relatable, encouraging, and honest! 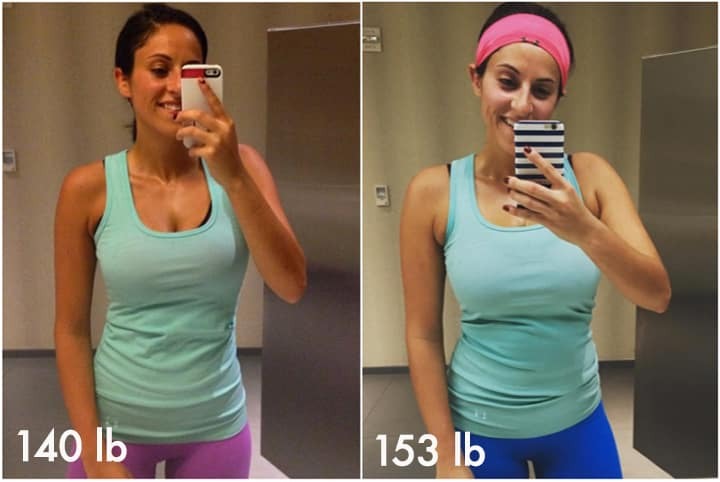 I am a very similar height/weight as you, and it is so encouraging to be able to relate and realize I'm not alone in fluctuating and that fluctuating does not equal failure--Thanks so much for sharing, and I'm cheering you on to meet your goal! This is great, Ali! It's funny I've been thinking the exact same thing because I stepped on the scale the other day and I had gained five pounds. I was surprised because I have been exercising a lot... but the random binging kills me. I am so disciplined in all other areas of my life that I let myself off the hook with food. Sometimes I think - 'Man I work hard and save money and discipline myself, I'm just going to let myself go buck wild for a while on food because I deserve it.' But then I'm left feeling crappy, and I realize there are other ways to reward myself. I just need to find them and stick to them. The psychology behind it all is so interesting. I will be joining you on your fit journey - I want to lose 10 pounds in a month which puts me at 10 pounds lighter by Christmas Eve. Totally doable, especially with spiralized meals. :) Thank you for the motivation! Ali, I've been making dishes with pomegranates this fall, and I found a better way to get the seeds out than under water. Go to this video - I was surprised, but it really works! http://www.marthastewart.com/1094444/easiest-way-seed-pomegranate Love your posts! I'm with you on the getting back to exercise program. I needed this today. You have a talent for that, keep it up! Hi Ali, I can relate to this post so much! I just got married in September, and have gained almost 10 lbs since. On one hand, I am really enjoying being less strict (and honestly, obsessed) about fitting in work outs and trying to eat extremely healthy, but on the other, I'm taking it too far in a way and eating stuff I never would have eaten before. I think I restricted myself so much before that now I just want to eat all the foods I didn't allow myself to pre-wedding. It's liberating not to worry about how to make sure my next meal super healthy, but I also just don't feel as good with the way I've been eating. It's definitely a journey and there's ups and downs. Just wanted to say thanks for sharing, a lot of us here can relate! Exactly! It's definitely a fine line between obsession and healthy. It's so easy to get caught up in the obsession of eating clean and then when you're off of it, it's so easy to go back to old ways and even eat things you know aren't going to make you feel your best. Thanks for sharing! I love reading these types of updates. It reminds me that I'm not the only one on this constant roller coaster. I love your "what I ate today" videos too! I'm obsessed with that vegi sandwich with avocado. All my coworkers are always like "what is that!?" Who knew a pile of vegis could look and taste so good! Keep it up girl! I'm so happy you're liking that sandwich!! It's the best! Hey there! Loved your honesty in this post. I too am jumping on the bandwagon and switching over to get it together mode this holiday season. I'm proud to say I just got an inspiralizer last week. I had the original one that you did not make and I stopped using it since it would always slide on the countertop. Yours works AMAZING, a million times better. Thanks! :). Will you be posting your meal plans and exercise plans as blog posts?